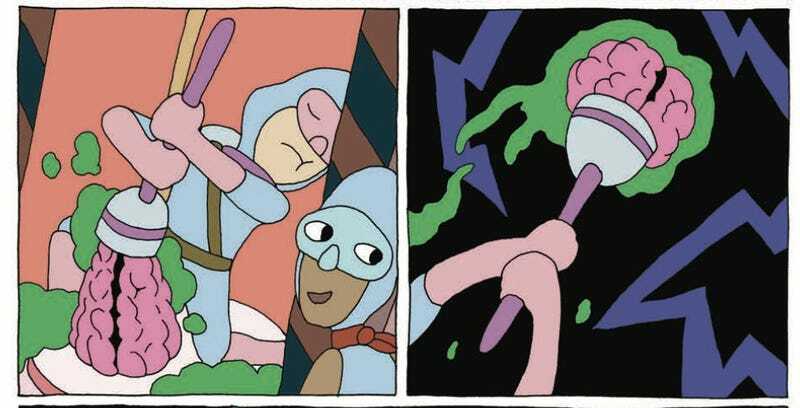 The great joy of reading Soft X-Ray/Mindhunters (Koyama Press) is in not really knowing what’s going on. Characters appear, and you can follow them easily, but what exactly they’re doing and what its significance is cannot easily be discerned. This is in large part due to how the author, A. Degen, structures his book. 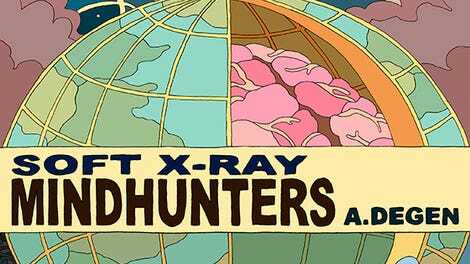 As the title suggests, the comic is divided into two threads—“Soft X-Ray” and “Mindhunters”—and Degen composes the book as a series of discrete stories. Each functions independently and establishes an explicitly demarcated beginning and ending, a unique cast of characters, relating a story that readers could conceivably follow without any knowledge of the others. This last fact is made possible in part because of Degen’s omission of dialogue. Degen draws cleanly and clearly, and for all the cacophonous action and psychedelic experiences depicted in the book, there remains a solid continuity between images, making the book incredibly fun to read. But because the contents of those images are so dense and deceptive, he also produces a book that requires—and invites—closer engagement. The book jumps around from thread to thread without any discernible rhyme or reason. The “Mindhunters” stories, which dominate the book, follow the adventures of Cherikola and Lalo. Their job, fittingly, is to hunt for things inside minds, or maybe it’s to hunt minds (couched in visual metaphor, it’s unclear which one it is). Whose mind? Who knows. The whole thing is a complex engine of jokes, with the first appearance of Cherikola and Lalo (on a page that introduces the stories’ essential characters) also including characters like “The Business Parasite” and “Snitch.” There is a sense that Degen is interested in exploring the psychic architecture established by ancient philosophers. Cherikola and Lalo are able to sneak past Beauty by concealing themselves behind The Parade Of Forms, an explicit reference to Plato and his world of forms (the essences of worldly objects). The whole thing is a parade of highbrow jokes represented by lowbrow visual metaphors—clever and funny precisely because of their seeming incoherence. The other thread, “Soft X-Ray,” is even more difficult to describe, as it features characters like Houseman, a man who has a house for a head. He wears a sash that reads, of course, “House.” It is in these stories that Degen really lets his interest in Japanese poster artist Tadanori Yokoo shine, and, on first read, it is difficult not to simply admire the cacophonous mass of color and claustrophobia that Degen invokes with his dense panels and repetition of crowded neon signs. While these stories are visually interesting—the very reason to spend more time with them in the first place—they are increasingly difficult to summarize or describe. Degen gives no context or explanation, and readers are left to figure it out for themselves. But giving yourself over to a comic and simply enjoying what it offers—the process of thinking about what various images could mean rather than being told what they do mean—is a rare pleasure.